PRICES for barley in southern Queensland have eased on the back of some feedlots booking coverage for many months ahead and shutting the order book. The price falls though were moderated by the continued rapid off-take in Brisbane of shipped grain from Western Australia and the pending arrival of further inbound vessels. Traders said movements in barley prices have been more significant than wheat. A week ago, free-on-truck Brisbane barley was trading at around $400 a tonne, and this week it’s traded down to $390/t. By comparison, the Brisbane wheat market since the New Year has eased around $5-$7/t, and wheat for the February March onwards delivery period has traded down to $426/t, down from the $430s in recent weeks. The market seems to have factored in a reduced supply of sorghum, as growers and traders watch later-planted crops, or those sown into limited subsoil moisture, fade in the heat and continued dry conditions. Sorghum prices in Queensland have lifted a little, with delivered Darling Downs bids at around $365/t for May onwards firming a few dollars in the past week or so. Unusually, early sorghum being harvested in northern New South Wales is being trucked south instead of north, and truckloads are being booked to deliver it as far south as the Griffith region. This has necessitated buyers in the far north of inland NSW to bid up if they wished to keep the grain near the Queensland border. Competitively priced road freight out of the Moree-Narrabri district at $25-$30/t was said to be landing sorghum into the Liverpool Plains at $375/t for feedlot use. 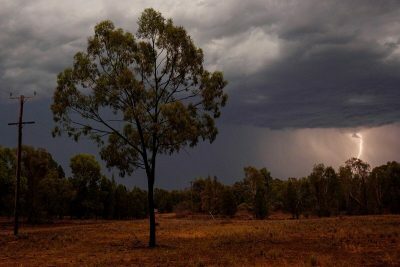 While Dubbo and areas east and west of it have had some handy rain in the past week, relentless heat, and a smattering of storms which have brought on wind and lightning have many graziers across NSW watching their pasture and groundwater supplies dwindle. Some graziers have reduced sheep and cattle numbers in the midst of the NSW heatwave, but traders said they were loath to buy wheat or barley to put in their silos at $430/t in case rain in coming weeks sparked a flush of pasture growth which would carry them into autumn. Delta Grain Marketing broker Brad McKinnon said ships arriving from WA will keep a lid on the market in the southwest slopes of NSW, where ASW wheat was trading at $450-$460/t, and barley $435-$445/t. Wheat delivered end-users in the Young district has been trading at $440-$445/t, and Mr McKinnon said some were considering buying sorghum as an input priced well below white grains. “Most positions are covered until February, and most people with livestock have bores, and dams that filled when we got 60-100 millimetres of rain earlier this month. “It’s further west where we haven’t had the rain. Farm Tender online broker Dwain Duxson said demand for hay has picked up now that people are back from holidays, and harvest has finished in Victoria’s latest areas. “There’s hay from Victoria and South Australia, and quite a bit of straw, around, and there’s a lot of canola hay from frosted crops, and some from failed barley and wheat crops. ASW wheat ex farm Wimmera has been trading in limited volume at $385/t, and $370/t for barley. Pearsons Group Swan Hill trader Reagan Stroud said this month has been unusually quiet in the cash market, and much less liquid than December. “There are more sellers than buyers, and that could be because the trade is long, and is trying to offload some risk, and we just don’t have the volume demand from export markets to absorb that,” Mr Stroud said. ASW wheat for prompt delivery into Melbourne has been trading at around $423-$424/t, while grain delivered into the Griffith region is trading in the mid $440s. Mr Stroud said grain shipped from WA did not price into Victoria at present, but previously has worked ts way in based on feed demand in east Gippsland. As reported by ABC Western Victoria, GrainCorp’s Nhill facility, with more than 150,000t of grain, took in a greater tonnage than was received in all of GrainCorp’s sites in Queensland, around 108,000t. Grazier demand continued to drive old-crop cottonseed values, while new-crop was also firmer on low liquidity. “Cottonseed markets gapped higher this week amid the influences of very tight old crop stock and ongoing extreme heat conditions” Woodside Commodities manager Hamish Steele-Park said. Spot values for cottonseed this week were nominally $570/t free-on-truck (fot) southern NSW gins, at least $50/t up on last week, and $600/fot in the Macquarie Valley of central NSW, while delivered Darling Downs seed was quoted at $680/t. These prices are $100/t higher than mid-December, when scattered storms dumped heavy rain on parts of the Darling Downs. New-crop gin-spread sellers were quoted this week ex Gwydir and Namoi Valleys at $460/t fot, up $60 on one month ago. The possibility of poor new-crop supply would see southern Queensland sites offer a premium increase relative to NSW, and cottonseed Darling Downs ex gin this week was quoted $480/t. New-crop seed supply typically becomes available soon after ginning begins around Easter, and the gins commence operation in the north as cotton picking moves south. Emerald in Central Queensland is likely to be the first gin operating, and is expected to start up next month.